Nearly 300 miles west of Santa Fe, the raging Colorado cuts a wide swath of terraced gorges, buttes, and beautiful Lake Powell. Overlooking Lake Powell is one of the most beautiful and different Santa Fe homes in the Bi'dahji' subdivision. 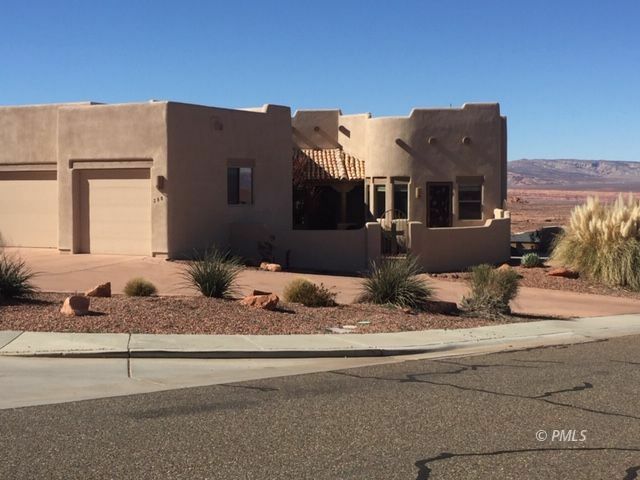 This 2002 four bedroom, three bath home is full of the wonderful Spanish building elements: portales, vigas, kiva fireplace, tile and private courtyards. Set on an edge lot in Bi'Dahji', it overlooks the Lake Powell National Golf Course and looks across the Colorado River to the Vermillion Cliffs. This showplace home has just been updated with new flooring to enhance the southwest decor. Living Room and Family Room both have propane fireplaces. Upstairs, there is a living room, dining room, kitchen with eating area, very large master bedroom suite with access to the deck and the first of three other bedrooms and the laundry. Go down the beautiful wide staircase and you will find two more bedrooms, a bath, family room and office. Both levels have wonderful access with decks and patios. The over sized three car garage is exactly what every man dreams of. Time for you to call for a private showing and be ready to move into your new home.